Bounniew Somsak, who is the Assistant to the LEOT School Director recently spent a few days down in Vientiane, where he visited the Soap4Life Foundation. This small NGO makes and distributes handwashing stations to local schools. It also makes and supplies the soap that is used with these handwashing stations. Mac Maness, the Director of Soap4Life, kindly offered to instruct Bounniew in how to construct one of these handwashing stations. It was then transported by bus to Luang Prabang and delivered to our LEOT school. It is hoped that in the new school year starting in September, LEOT will be able to make similar handwashing stations and then supply and install them at various village schools throughout the Luang Prabang district. It would be too expensive and also not practical to continue to get them sent up from Vientiane. 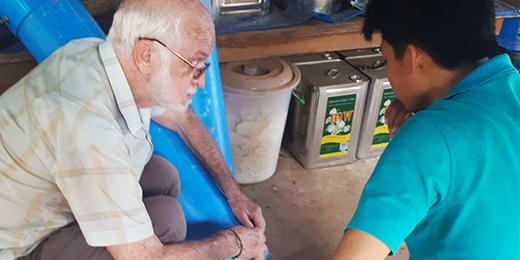 While in Vientiane, Bounniew also visited Abundant Water, where he learnt more about water filtration and the building of filter stations for schools. LEOT has long been a keen supporter of this program. LEOT believes it is important for all village schools to have access to clean water, toilets and handwashing facilities and we help village schools access clean water through our community projects.